NOW AVAILABLE FOR PC AND iPhone/iPad! Please download it from below. Quickly - which of the aircraft (A, B, or C) would you expect to follow? As far as real ATC procedures go, we admit that this example is somewhat unrealistic and a bit sneaky.� However, it serves to illustrate an important point. Did you choose the GulfStream I turboprop (the first image)? The corporate jets pictured here are not Gulfstreams. Being able to identify aircraft quickly and accurately will make you a safer and more competent aviation professional. It's a skill that carries into the air and on taxiways and runways and helps ensure the safe and efficient use of our airspace system. However, more immediately, this is a good skill to have for your career. If you're like most people who are likely to be reading this, you probably already have a fairly good working knowledge of a number of common aircraft types. However, what Name That Plane! will do is really elevate your level to that of a true professional. Name That Plane! 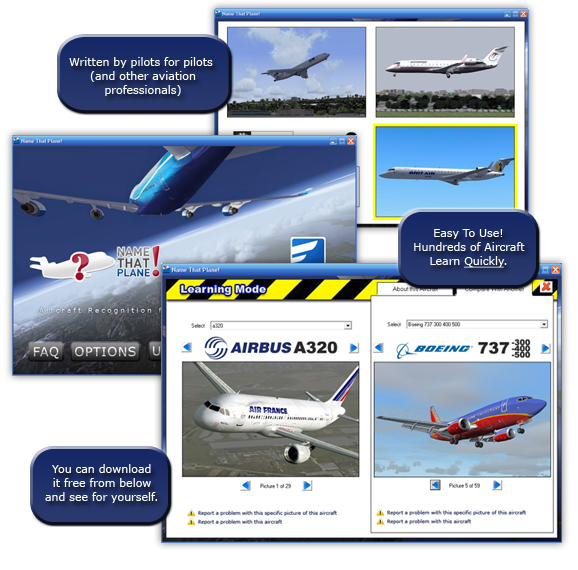 makes the process of systematically learning the bulk of civil aircraft in the world today, including airliners, corporate jets, regional aircraft, and larger propeller/turbopro aircraft easy. But please don't take our word for it - you're welcome to download the software for yourself, free, right now, and see for yourself. You'll be surprised at some of the common errors you may be subject to and also how quickly your knowledge will increase through use of Name That Plane! A wide array of study and learning modes that turn the learning process into a fun game. A "Captain's Challenge" exam mode where you can really test your skills. 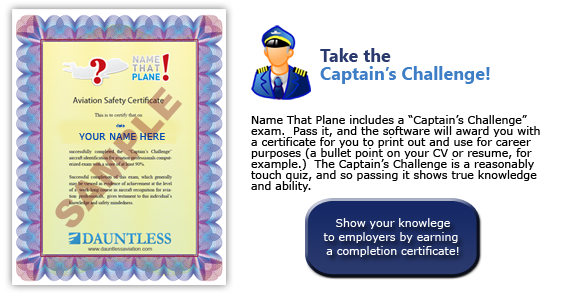 If you pass this, Name That Plane can print a certificate of completion for you that you can use for your career. Free, built-in lifetime updates. When we change our database because, for example, a new aircraft is produced, you can get the latest and greatest content with only a few clicks. Much, much more. Please don't take our word for it - download it from below and see for yourself! Please note: the above list may be incomplete as we are constantly refining and adding to the software and don't necessarily always update the above list as we update the software. Updates are always free and are available via a built-in self update feature. There are thousands upon thousands of aircraft images in Name That Plane! to help you learn. Like you perhaps, I love airplanes and I always have. After several thousand flight hours and thousands more spent reading aviation-related books and magazines I figured I pretty well knew my way around an airport. And so one day I'm taxiing in and Unicom tells me to park it next to the BeechJet. And then it occurred to me; I wasn't really sure which of the bizjets in front of me was the Beechjet, which was the Hawker, and which was the Lear. Some quick radio back and forth cleared it up soon enough, but in my mind the message was clear; I could do better. We all have some knowledge of aircraft types, but I think that many pilots could stand to identify aircraft better. I wrote this program not to turn you into one of those guys who sits at the ends of a runway with a pair of binoculars and can tell a DHC Dash 8-300A from a 300B by smell (indeed, in most of the program, variants within a given aircraft type are pretty much ignored). Rather, I wrote this to help the active pilot become a safer and more proficient pilot. One goal is that when ATC tells you to follow the Canadair Regional Jet down the taxiway, you don’t find yourself on the other side of the airfield behind an Emb-145. Another goal is that you can be conversant and sound credible during a checkride or airline interview. The software is structured so that you can see aircraft side by side and learn to identify them. Use of the program is pretty straightforward—do try all the different options. With a few hours study, with this program, you should find that much of the aircraft type vagueness in your mind has cleared away. Name That Plane can truly make you a safer and more capable aviation professional.